Another really comfy outfit today! We all know that I have been wearing oversized sweaters like they are going out of style! I love this one from A Modern Boutique. It is a little more oversized then most that I have, but that just makes it extra comfy. And red and grey is one of my favorite color combos. It has been sooo cold here in FLorida. I am such a wimp when it comes to the cold I even turned our heat on. But it has been such a nice change and I love wearing boots and sweater. Your style is amazing beauty! 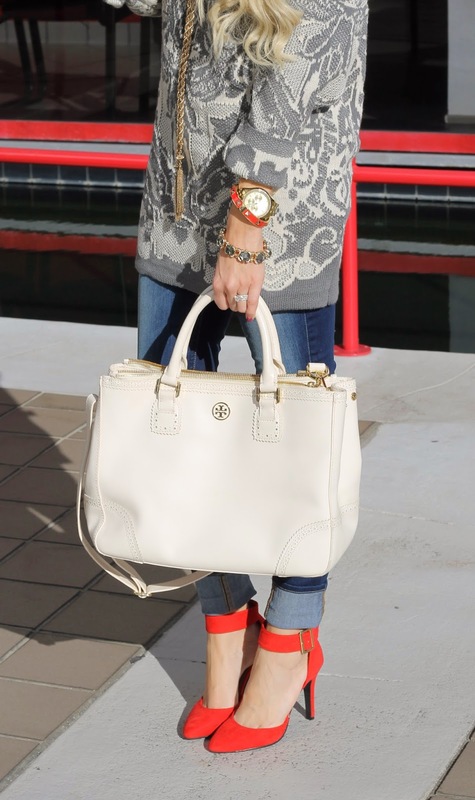 Love that sweater and the layered jewelry! I love all that jewelry! It totally dresses up the sweater. Loving the jewelry and the pop of red in the heels!! Adorable! The jewelry is just amazing with that sweater! Cool oversized sweater, love the comfy look of it! I so need a white perfect bag like yours! Love the look! Oversized sweaters are my favorite! Love the outfit, the sweater looks so comfy! Such a cozy and trendy sweater! You accessorized it perfectly. I just love love all of your accessories. You mix them all so well! Looking at how you put your outfit together just makes me smile :) Happy Monday! Loving this outfit and the bag is absolutely gorgeous!! Hi! I'm a graphic designer and I'm currently working on a blog. I was asked to create the scrollbar you (and other blogs) have at the bottom of your posts showing "similar clothes". Could you please tell me something about where can I get it? Thank you so much! I really LOVE this sweater!!!!!!! The details are so nice and it looks super cozy!!!!! What a great shoot, and that sweater is killer! There are more comfy sweaters and comfy flannels that can be found at The Ivy Shoppe on Etsy. In all sizes!